A Trip Around the World quilt is almost a rite of passage in the life of a quilter. Its classic design and simple construction makes it appealing to everyone. It’s also a great way to use any 2-1/2″ strips you may have acquired. The original tutorial for the scrappy 12″ block version of this pattern was designed by Bonnie Hunter and can be found on her blog, here. 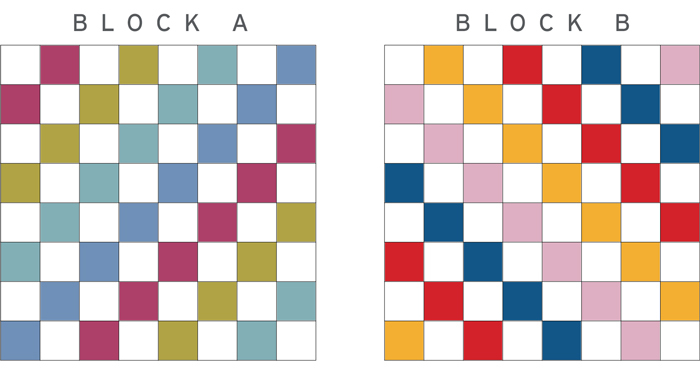 The method I used to construct my block was a mixture of ideas from Bonnie, Alli @woodberry_way and Cindy @clammon. Both Alli and Cindy have made stunning versions of this pattern with the alternating background strips. (The links above will take you to their finished quilts. Alli used a Jelly Roll and Cindy made her version scrappy with a distinct colour palette). The inclusion of the background strips makes a big difference to the overall feel of the finished quilt. I felt the fabric was going to benefit from the calming effect of an equal amount of background fabric, which would give the colours a chance to shine and not compete with each other. As soon as I began to place the blocks on my design wall I knew I had made the perfect choice. While it is a little difficult to see in the images, many of the prints in the Lemon Tree collection are directional. Because of this, I assembled my blocks ensuring half of the chains ran diagonally up from the bottom left to the top right (block A), and half ran in the opposite direction down from the top left to the bottom right (block b). By consistently pressing towards the patterned fabric and laying out my blocks in this way, I was able to nest all my seams. And, my OCD tendencies were able to rest easy because the directional fabric was oriented in the same direction – woohoo, that’s the sort of thing that makes me enormously happy ;). To tell you the truth, this whole quilt makes me happy! It’s a little bit of sunshine on an overcast day ;). Pattern: Scrappy Trip Around the World quilt variation. Finished Size: 64″ x 80″. Background: Unknown. I pulled it from my stash, but it is reminiscent of an ivory background. When making this quilt I cut enough strips to make a second quilt! 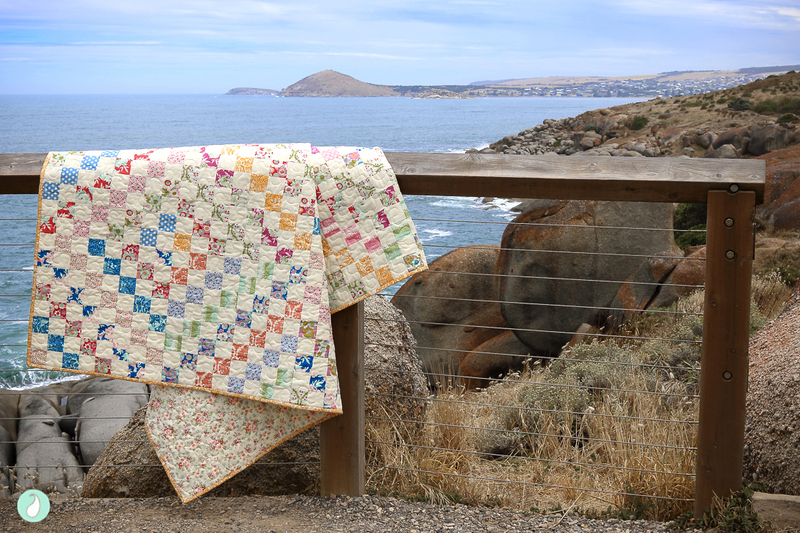 Would you like to win your own 2-1/2″ x 21″ strip collection of Lemon Tree to make yourself a Trip Around the World quilt? (Or maybe you could use the strips to make something from the new book – Start with Strips by Susan Ache. I admit I was a little tempted to keep the strips to do just that, but I reminded myself it’s good to share ;). Leave me a comment on this blog post and let me know what you are planning to make next. 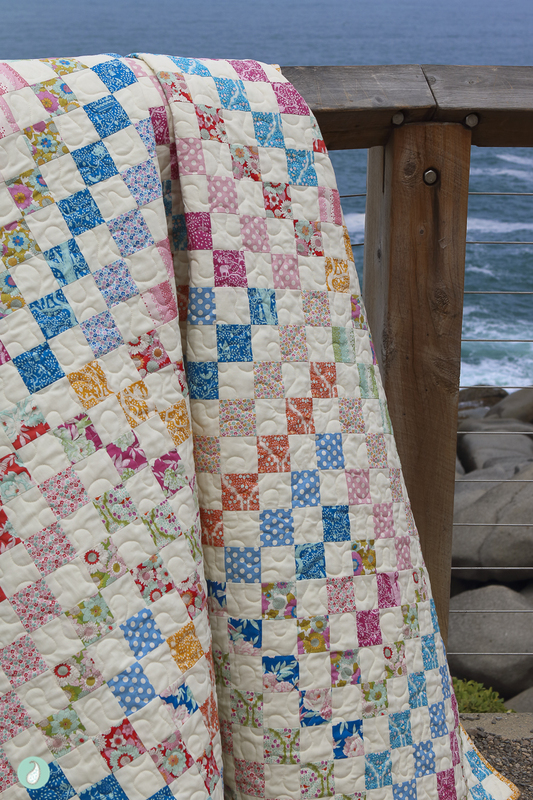 I am trying to decide between a mini Trip Around the World quilt, or Train Tracks from Susan’s book…??? Tag a friend on the giveaway post on Instagram, inviting them to participate too. I will pick a random winner on Saturday 17/02/18. GIVEAWAY NOW CLOSED. 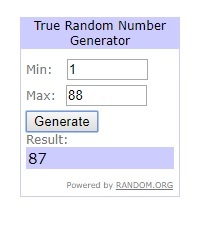 The winner is comment #87 – Cat. If you would like more Lemon Tree fabric inspiration don’t forget to check out the Caravan Tote I made for my daughter. Love this quilt and thanks for the giveaway. I am going to be making a quilt for my daughter which is a tulip quilt using a jelly roll. I am working on the plus quilt and will b e adding blocks to my X plus quilt thru my bee hive group. I would love to use the strips for one of the patterns in Susan’s new book. I am going to be brave and cut into my liberty of London material for a simple patchwork quilt. I am starting a Postcard from Sweden as part of a quilt along. My next planned quilt will be a scrappy rainbow quilt for me. At least it was, but after seeing this one…too many quilts…too little time!! I have a retreat coming up in March so I am prepping for that. My big project at retreat is a California King size pineapple quilt. I saw an antique version I absolutely must replicate! I love this quilt so much and I would love to make my own trip around the world. I made a scrappy version with the pb&j line but I love the variation of using a solid background. So pretty!! 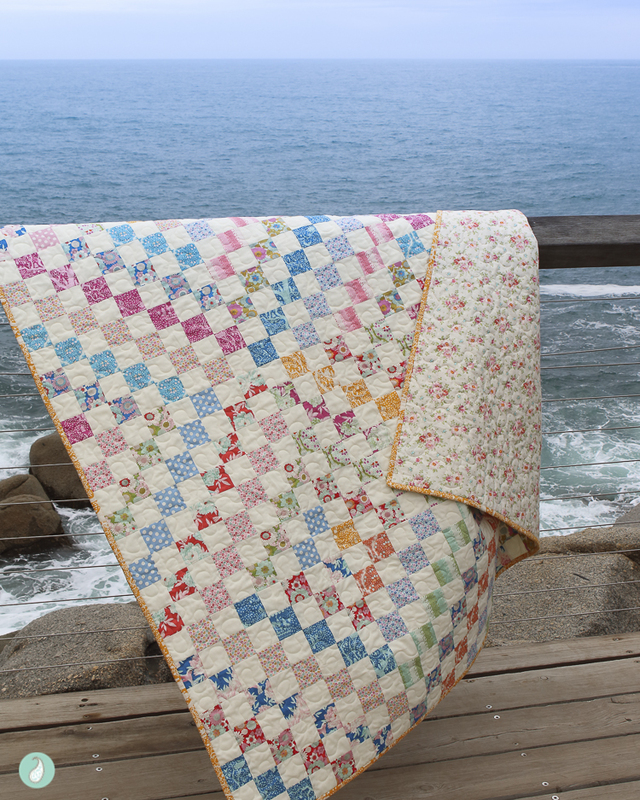 I just ordered my Bloc Loc Flying Geese ruler and I am signed up for the Village quilt along! I’d better get cutting! Your quilt is amazing and I agree, a rite of passage, so I need to make one! Such a beautiful quilt. My daughter wants this same pattern for her bed when she goes to college. My next planned quilt is a jelly roll quilt using a roll of Guernsey. I just need to pick a pattern from a jelly roll book I purchased a few months ago. I love your version of the scrappy trip around the world! Thanks for the opportunity to win! A trip around the world is on my quilt list to make! Thanks for chance to win! I’ve wanted to see tilda fabrics in person! I’m going to finish my Alison glass long time gone quilt. I’m going to make 2 baby quilts next. I am working on two quilts now. 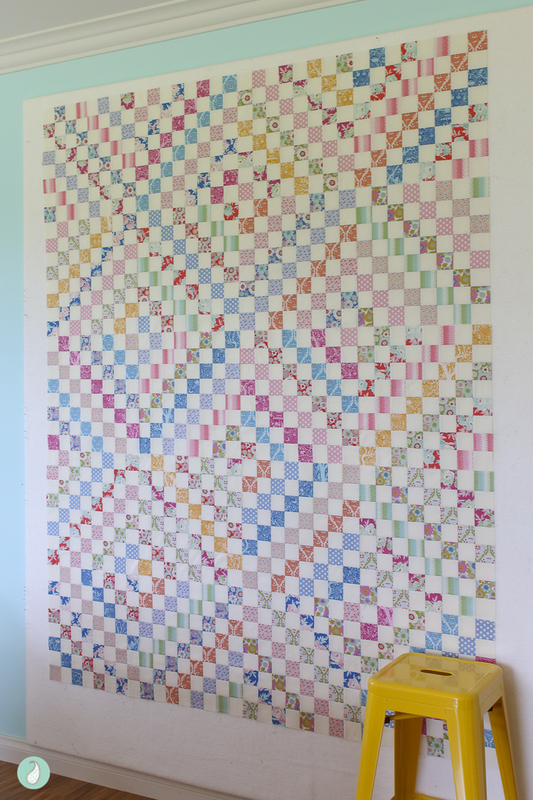 Once they are done next up is a paper pieced book quilt using Tilda Harvest…..then a Swoon 16 using Tilda Circus. I don’t have Lemon Tree yet and I’m dying to get some! The Trip Around the World quilt has been on my list for a long time! I would Lovett make one! My next quilt is actually going to be 2 baby girl quilts for my sister, who’s expecting twins in March! I’m planning on making a quilt for my new grandson. It has a baseball design on it. I am planning a quilt using my children’s outgrown clothes. I would make a quilt quite like the one you posted! I love it! I’m worked my on a village quilt and a blue/green/aqua/white star quilt. Next up, maybe a triangle quilt? I have so many I want to make! 🙂 Love your cheery quilt! Gorgeous AND happy. Can’t beat that! Next on my list is to make a baby quilt for my sister-in-law and a baby quilt for my friend. I’m going to make pixelated heart quilts for my two sweet nieces. It’s my daughter’s birthday in a couple of weeks so I am going to make her a quilt in her favourite football team colours – luckily they’re my favourite too. I’m planning to make a spring mini quilt next. Just have to pick a pattern. Love your beautiful quilt! I am going to make a quilt for my friend who lost her daughter unexpectedly. Just trying to decide on a pattern. I would love to make a scrappy trip around the world quilt or a Down Memory Lane quilt as my next quilt. Thank you for the wonderful giveaway and your quilt is beautiful. Beautiful quilt. I will make something to my summer house. I am working on a jelly roll rug at the moment and my Flower Garden quilt what will be next not sure Spools 2 and Blocks for the exchange I am in but this is subject to change. Beautiful!! I love your fabric choice! This quilt absolutely sparkles!! 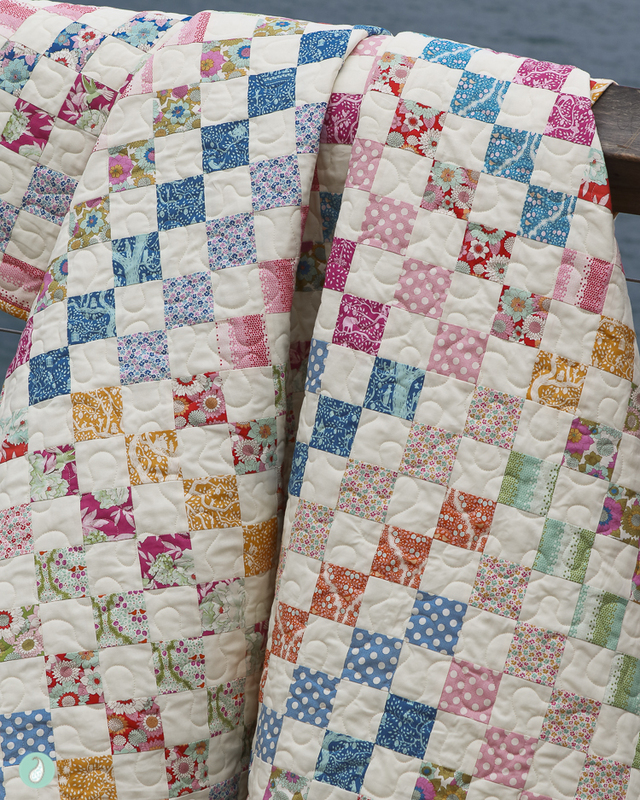 My next quilt that I want to make is a BOM Barn Quilt! I am making blocks in two color ways! Thanks for the giveaway. This year I am focusing on finish some UFO and WIP, so I am working on two scrappy quilts and next week I’ll receive backing to finish a quilt from 2014. This is a sweet quilt. I like your approach. There is so much to learn in our lives. I’m planning to make a floral scrap quilt. It’s been running around in my head for some time. Your quilt is gorgeous, I just saw it on instagram and now I want to make one lol, I have made many quilts but not the scrappy trip around the world , its now one I will make, with tilda fabrics.I am just finishing up a quilt this morning,Vegas wedding quilt, then on to a quilt for my son, thanks so much for the giveaway, very generous. I’m working on a modern log cabin and loving it. Your quilt is smashing! I’m finishing up a one block wonder and contemplating a scrappy with low volume project! Would love to win this – have made one of these using Bonnie’s technique and it was so fun and easy – I used scraps from all the dresses I’ve made my granddaughters over the years and they love it! I’m working on quilting some UFO’s and am piecing a January Block quilt. I love this quilt of your and the fabric and would love to make this!! I love this quilt. The colour balance is perfect. I’m working on an HST quilt in batiks as a wedding gift for my nephew. I would love to win this giveaway. 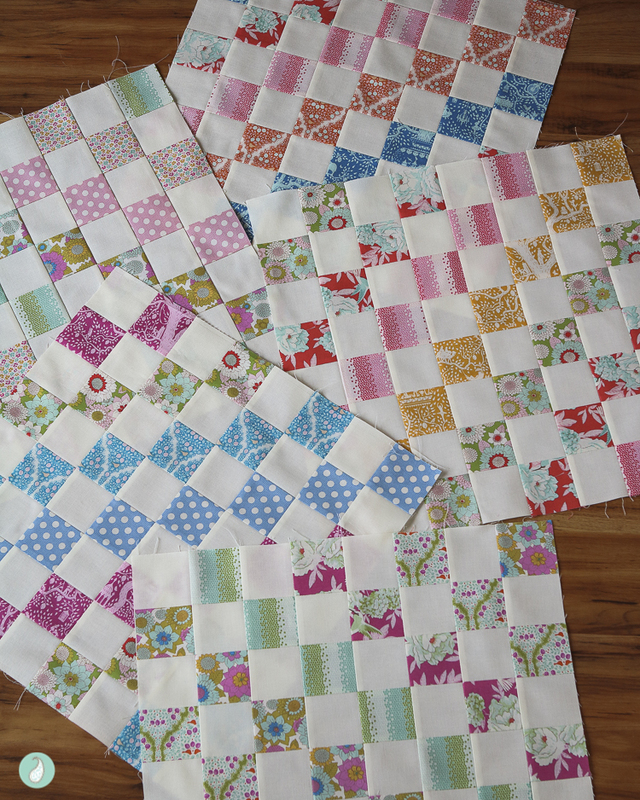 I’ve just started a new baby quilt using my Daisy Chain fabric bundle. Thanks for the giveaway, I love the Tilda fabric collections. I have not seen a scrappy trip with the white before and I love it! This quilt is on my to do list this year and now it’s moved to the 1st on the list! ❤️ It! I’ve been in love with all the jelly roll rugs I’ve been seeing on Instagram. My kitchen could use some brightening up! Thanks for the inspiration; this is going on my to do list. Looking forward to finding the right fabric that will give me the soft and cuddly feel like the quilt you have shared. I want to make a log cabin quilt next, I have never made one and think it is time to make one. I love this quilt. It makes me smile. What am I working on next? We are moving, downsizing. All my material and sewing equipment have been packed away for months. We should be moving in 21 days. Then I get to unpack and organize my new sewing spot, a nook under the stairs. Then I can piece together a quilt I am making for my bed. I saw it in Pinterest but don’t know the name. Oh, what a dreamy finish! Trip Around the World has been on my “must make” list for awhile and your version using Lemon Tree is certainly more than enough incentive to get on with it. LOVE this quilt! I am going to pick out one of my UFo’s and finish it. I like to go between a new project and a UFO. Little incentive! This trip around the world is definitely on my radar as a new project! Happy sewing! LOVE that quilt! I’ve made two TATW quilts, and I totally agree about using the neutral fabric strips so that the fabrics don’t compete with each other. The next quilt on my to-do list is a “Plus” quilt for the Pediatric Critical Care Unit of a local hospital. I have about half of the fabrics cut – now to find time to sew it! I really like this trip around the world. I would like to make a queen size quilt. Thank you for sharing. I want to make Trip Around the World as soon as I can get my hands on the fabric. I love it. Love the creamy nuetral with the soft colors… yummy! I’ve made the original Bonnie Hunter version but would love to try this with the alternating nuetral strips! I want to make this quilt! It’s simply gorgeous! 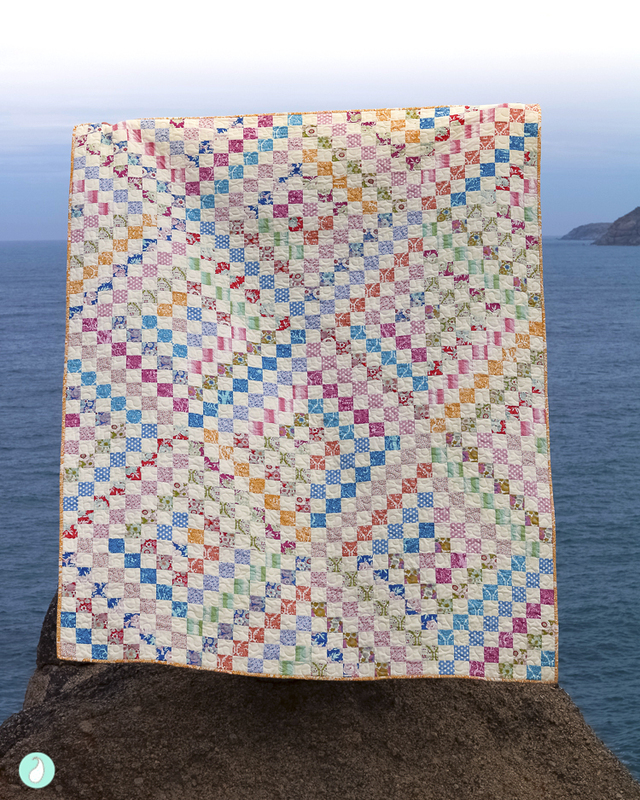 I will be starting a Library quilt by Kaffe Fassett when I work out different fabric colours. I want to make a ‘storm at sea’ next. I would love to win the strips! I think I would make your same pattern because I love it! It’s a great quilt! I just ordered the start with scraps book which also looks fun! I’m on mission to finish some wips. 3 kid quits and one for my sister! So sweet of you to share!! 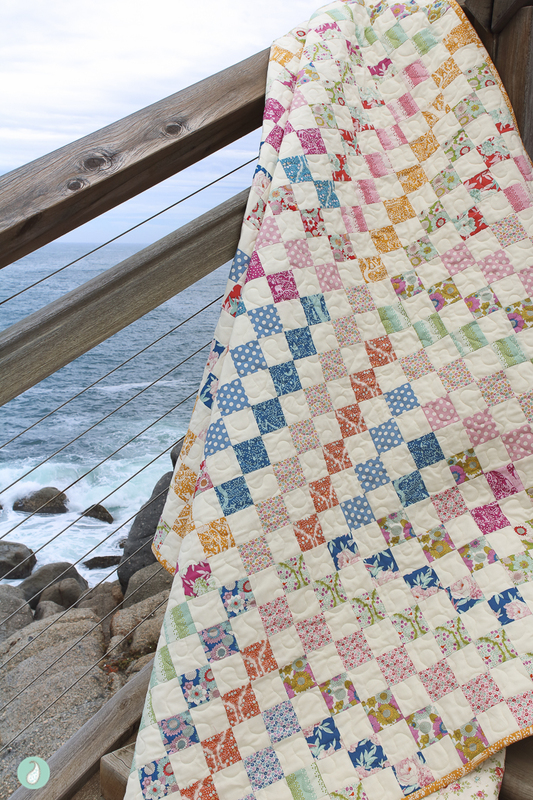 I am going to finally cut into some new pinks, greens and greys that are so adorable and start an EPP diamond quilt! Can’t wait. I’d love to win these. 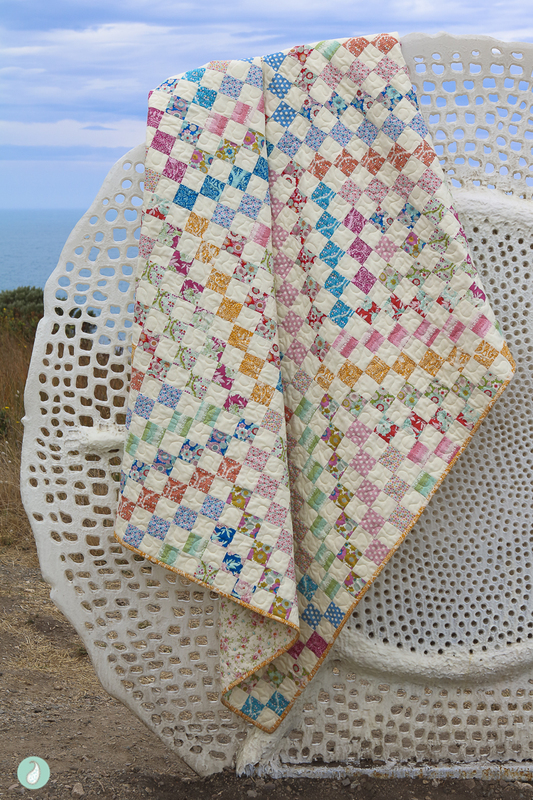 Tilda and a Trip Around the World quilt are both on my list to try. Lovely work! Well, my next quilt just may need to be a Trip Around The World! I’m loving this so much! I love this quilt, I would have to make one just like it if I won! In the meantime, I am making some spring tote bags for some friends. My next quilt will be a Queen sized quilt using Bread N Butter fabric and a Sherri Falls pattern from the cover of her most recent Christmas book! 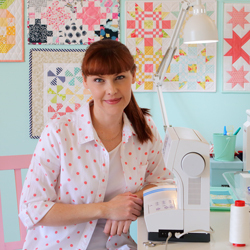 I absolutely love your trip around the world quilt and the Lemon Tree fabric! Looks so beautiful! I have so many projects going on so I shouldn’t start anything new but Trip around the world would be nice…. Next up are a couple of I-spy quilts that are long over due. I keep getting distracted by beautiful quilts like yours. The TATW is on my list. Thanks for the giveaway. Boy this is beautiful! I’ve been quilting about 18 months and have yet to make a round the world quilt. My 16 year old daughter loves to travel (and the idea of travel) and spends spare time planning trips to far flung places in great detail. I think she would love a Trip Around the World Quilt, and I will try making one for her. Thanks for the inspiration and the giveaway! I would love to make a Trip Around The World Quilt. Those fabrics are divine. I want some Tilda so badly! Currently I am piecing Star Blossom. The pattern is by Bonnie Olavson. Keeping my fingers crossed! oh my goodness how did I not know about your blog??? I LOVE IT! This is so great! I would love to make this trip around the world quilt and I absolutely love the fabrics you chose! My next project is an Ireland flag quilt for my missionary son! Thanks for doing this fun giveaway! I am planning on making the Strawberry Social quilt. I make strawberry jam every year just before Easter. I’m going to make a king size flannel quilt for my son. I have to finish a secret project first and then get rolling on the flannel. It’s a star quilt so it’ll be fun but so huge I’m a bit scared to start. I have never made an official quilt, but this makes me want to try. 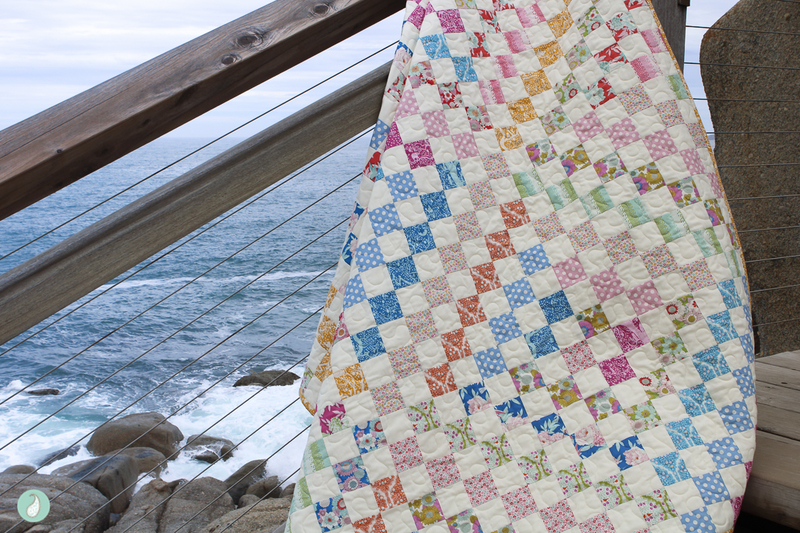 I’ve always loved the comfort vibe a patchwork quilt puts off. I love these color choices. They allow you to take in the while quilt. I have my Nightshade fabric and a pattern out for the next project to make. I love this line so much!! I’m working on a quilt called City Tiles by Emily Dennis. I’m going to the one you made! I love it- i have made a trip around world before tans they are my favorites! Thank you for generosity in doing a give away! I am so new to Tilda fabrics and sew in love with them! I’m ready to try a new pattern……putting my name in the hat!! Beautiful quilt and photography!!! The Tilda fabrics are so pretty! My next project is the Kith and Kin quilt by Lella Boutique. I LOVE the Train Tracks quilt in Susan’s book too.